Sauté mushrooms for a bit and add green beans, continue to sauté until green beans are tender. Remove to a plate or shallow dish. Sauté chicken turning to brown both sides, cook through. Remove and set aside with green beans and mushrooms. 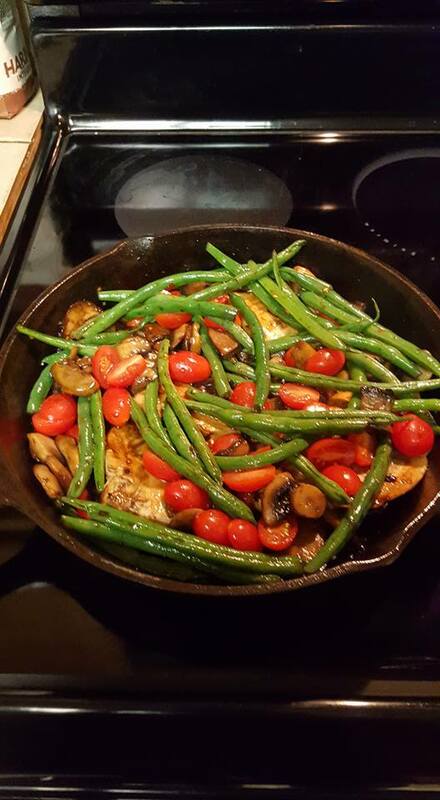 Add the Italian dressing to the pan with the honey and balsamic and cook down a bit, add the green beans and mushrooms back to the sauce and stir, add the chicken and stir, add the tomatoes and stir. Eat a nice hearty salad full of raw veggies before this meal is served. I suggest having the salad pre made and when you are done adding in all the above items, turn off the heat, cover the chicken dish with a lid and enjoy your salad. Sorry, no bread, you will not even miss bread after a while trust me. If you love bread then I suggest sourdough, one slice, and only twice per week.